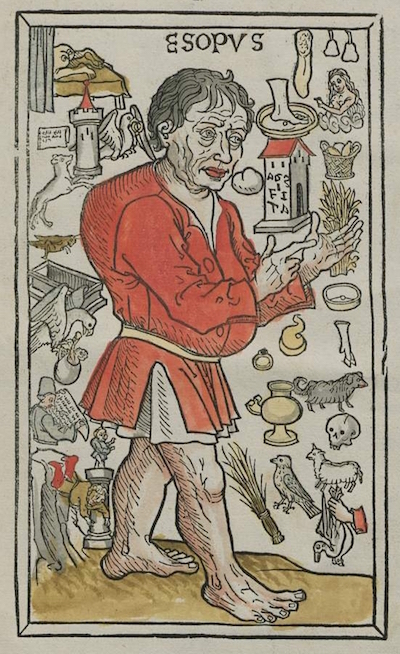 Fabulae Aesopi by Heinrich Steinhöwel, circa 1477/78. You can use this link to browse posts from this book, and you will find the table of contents below. This beautiful edition with hand-colored illustrations is online at the University of Munich, which has also digitized numerous other editions of Steinhowel's Aesop in both German and Latin: BSB-Ink A-70 - GW 352. Because Caxton's Aesop used the same woodcuts (although there is not a facsimile edition of Caxton online), I will be including the Caxton version of the fable with these illustrations; you can read Joseph Jacobs' edition of Caxton online at the Internet Archive.